Fuji GX617 panoramic camera description and user report by Steve Walton. The Fuji GX617 panoramic camera uses 120 roll film to produce 6x17cm negatives and transparencies of exceptional quality. It’s a simple mechanical camera, built for arduous outdoor use and loved by landscape photographers. Langdale Pikes, Cumbria. Fuji GX617, Fujinon SWD 90mm, Fuji Velvia 50. The Fuji GX617 has been discontinued for several years but remains a much sought after camera. It is a well made and durable camera, designed for years of hard use in outdoor environments. The system comprised the camera body with drop-down rear door with adjustable film pressure plate, the 120 or 220 film is loaded from left to right with the usual arrow index mark on the upper rail to indicate the start of the format for even frame spacing. There is a shutter release and an almost conventional film wind-on lever on the top plate. The Fuji logo slides apart to reveal the battery compartment for the electromagnetic release. The batteries are twin CR123A’s and last for a very long time as the only thing they power is the release. If buying second hand, it’s worth checking the battery compartment for signs of leakage. It’s not unknown for batteries to be left in situ for several years and forgotten about until there is a problem. It’s a good idea to replace them at least once a year. The only time I have ever used the electromagnetic button release is on the few occasions when I have resorted to hand holding the GX617 for some reason, usually because of windy conditions. For the most part, the mechanical release on the lens is much more convenient with a cable release and this does not require any batteries. There is also a mount on the top plate for the external viewfinders. 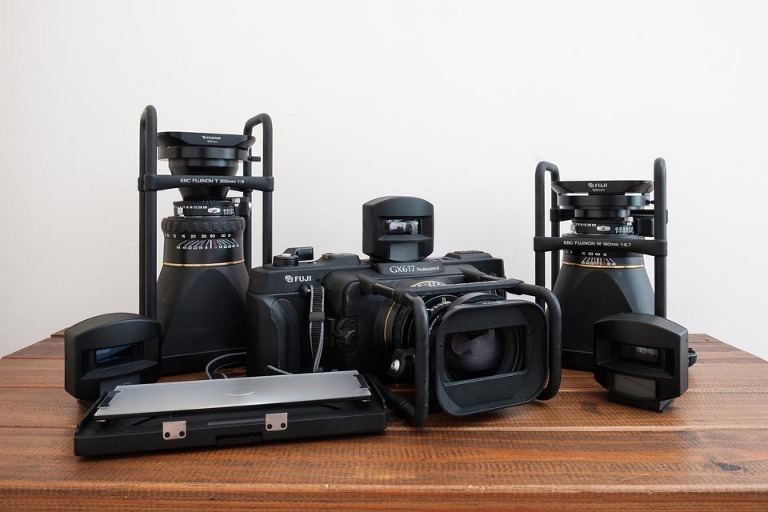 There are four lenses in the GX617 line up, all Fujinon EBC lenses in helicoid focus mounts and protected by the distinctive ‘crash bars’ to protect these expensive and vulnerable optical marvels from impact damage. The lens range is from 90mm, 105mm, 180mm and 300mm telephoto. All four lenses are spectacular performers, Velvia transparencies have to be beheld to appreciate what these lenses are capable of and high resolution drum scans create massive files with detail resolution that can only be seen at huge enlargements and print sizes. Anyone who likes the Hasselblad Xpan format should really try 6x17cm format for comparison, the difference in quality is nothing short of astounding, but so is the cost of feeding the beast! At current prices, you will pay around £10 per 120 roll of Velvia including processing. At only 4 exposures per roll, each time you trip the shutter and wind on the the next frame, you have spent at least £2.50. This gives some perspective to the running costs of the Fuji GX617. However, it is a great system for using black and white film to produce high quality prints at large sizes. I no longer make wet prints in the darkroom, after processing the film (either Fuji Acros 100 or Ilford Delta 100), I scan the negatives to create Imacon 3F raw files and after a couple of gentle contrast and shadow adjustments, I save a 16-bit RGB tiff at 4000dpi to continue the workflow in Adobe Photoshop 6. South Sawyer Glacier, Tracy Arm, Alaska. Fuji GX617, Fujinon SWD 90mm, Fuji Velvia 50. Luskentyre Beach, Isle of Harris. Fuji GX617, Fujinon SWD 90mm, Fuji Velvia 50. Llynnau Mymbyr, Snowdonia. Fuji GX617, Fujinon SWD 90mm, Fuji Velvia 50. An added benefit of working with black and white film is that screw-in filters (67 or 77mm) are much easier to use than square filter systems for tonal control. This means I’m carrying less equipment and weight, usually I only use a Heliopan O22 filter with the GX617 , as in the image above. Each lens has it’s matched external viewfinder and these are very useful to use by hand to assess angles of view and composition etc before setting up the camera on the tripod. I use a 14″ cable release screwed directly into the lens shutter attachment. It’s a bulky camera with even the 90mm lens attached, bolt either the 180mm or the huge 300mm lenses onto the camera and the combination suddenly becomes massive and heavy. Of the three GX617 compatible lenses I own (90mm, 180mm & 300mm), the 90mm is my most used as I have a natural preference for wide angle lenses. My least-used lens is the 300mm telephoto, it’s a very demanding lens to use and the camera needs to be rock-solid to avoid shake as the telephoto effect is much more powerful that many may at first realise. You really do need a distant scene or object to use the 300mm to best advantage, they do seem to crop up for sale fairly regularly and I would guess most expamples have had little actual use in the field. The 180mm is a delightful lens, giving a more natural perspective without the drama of the 90mm. If you already have or are considering buying a Fuji GX617, I would recommend both the 90mm and 180mm lenses to complete a good, solid ‘panoramic’ camera set-up. A ground glass focusing screen is also available, I have one but rarely use it as it is not really practicable in many situations, especially with the 90mm lens where the projected image is very dim. One final caveat to buying into the system is to ensure the centre graduated neutral density filter for the 90mm lens is also supplied. Look after it well as they are impossible to find independently and would cost whatever one needs to pay to acquire one (think in terms of £100’s!). The same goes for the external finders, if you break or lose one, you have a real problem. The earlier model Fuji G617 has a fixed 105mm lens and finder and is a cheaper option, but is more restricted in usability. Parkhouse Hill and Chrome Hill, Peak District. Fuji GX617, Fujinon SWD 90mm, Fuji Acros 100, Heliopan O22, developed in Rodinal 1:50. Boxing Glove Stones, Kinder Scout. Fuji GX617, Fujinon SWD 90mm, Fuji Acros 100, Heliopan 25, developed in Rodinal 1:50. There are a number of alternatives to the GX617 worthy of consideration from other sources, such as Horseman, Linhof, Widepan, DaYi, etc, but all 6x17cm format cameras are manually operated, mechanical behemoths. The 3:1 aspect ratio is an acquired taste, I personally love it whilst other prefer a 2:1 ratio such as 6x12cm but no one could argue with the imposing scale of the negatives or transparencies. One other effect of using these cameras is that you will always attract attention when using them and it’s a frequent occurence to have passers-by watching and wanting to look through the viewfinder and talk about the camera. The real benefit is that 6x17cm images can make wonderful wall art, especially with high quality scans from correctly exposed Fuji Velvia 50 transparency film. Ogwen Valley, Snowdonia. Fuji GX617, Fujinon SWD 90mm, Fuji Velvia 50. Fuji GX617 panoramic Camera Overview. The complete Fuji GX617 outfit. A wide angle 105mm f8 lens was also available during the manufacturing period, but is not a lens I have ever felt I needed. The SWD 90mm mounted on the camera is my most used of the three. The Fujinon GX617 lenses are capable of producing superlative images quality. They are large format lenses mounted in helicoids and permanently attached to their respective cones. The ‘crash bars’ are intended to protect these expensive chunks of glass and alloy, but they do make using 100mm filter systems difficult. Only the SWD 90mm will take a Lee 100mm holder with a 77mm wide angle adapter and close focusing will become difficult as the filter holder will foul the crash bars as the lens is extended. A purpose-built flight case was available and makes storing and transporting the outfit easier. This is bulky and heavy equipment! These are the ‘must-haves’ to go with the available lenses. Images are composed with detatchable direct vision viewfinders and the SWD 90mm needs to be used with the bespoke 2x centre neutral density graduated filter. The rudimentary lens hoods are more useful for protecting the front elements of the lenses from stray fingers, but I am an inveterate lens hood user who would always use one, no matter how effective or otherwise it may be. The viewfinders and the 2x centre nd filter are all bespoke to the system and are mandatory, they are probably impossible to replace by now and would very likely be very expensive if they were. If you are considering buying into the Fuji GX617 system, make sure the viewfinders and centre nd filter for the 90mm are all intact. One useful aspect of detachable viewfinders is that when I’m out in the hills, I can keep the viewfinder in a pocket and predetermine the composition with it before setting the camera up. It saves a lot of time! A ground glass focusing screen with a fresnel centre spot is usful for critical composition and grated filter placement. As it can only be fitted with the back door full open and swung downwards, the ground glass can only be used when there is no film in the camera. It’s part of the kit I rarely use, but there have been occasions when I have found it useful and I would rather have it that not. As with all the other Fuji GX617 accessories, the ground glass is now rare and proportionately expensive. The Fujinon 180mm f6.7 lens gives an angle of view that could be considered ‘normal’ for the format. It’s a useful focal length for when 90mm is just too wide and I would advise adding it to the outfit. I use it secondary to the 90mm and it does give a pleasing perspective in some situations. A Lee or similar 100mm filter holder will not fit inside the crash bars on the Fujinon W 180mm lens. The Fujinon T 300mm f8 is a true telephoto lens. I use it very rarely as the compression is quite extreme for UK landscapes. I can think of plenty of locations in the US where the T300 would come into it’s own! You will need a very sturdy tripod for this lens, the slightest movement will result in blurred images and slow emulsions are very difficult to work with, especially if there is a slight breeze. It’s a once-in-a-while lens for the Fuji GX617 and you have to be sure that you will use it enough to make the purchase worthwhile. As with the 180mm lens, a 100mm filter system holder such as Lee or Formatt-Hitech will not fit inside the crash bars of the 300T. Fujinon T300 f8 lens. The telephoto compression is obvious in the image below. There is a substantial tripod mounting plate on the base with a 3/8″ socket fitted with a removable 1/4″ tripod screw insert. Top plate, from the left: battery compartment, bubble level, back door release catch, viewfinder locking button (red), film length selector (220 or 120), frame counter (4 on 120, 8 on 220,) film wind-on lever, threaded elctro-mechanical shutter release. Make sure the strap attachment bars that are set into the body have not worked loose. Mine are securely fixed in place with Loctite after I noticed one of them was beginning to loosen itself! The battery compartment is accessed by sliding the top cover towards the back of the camera. The camera is fully mechanical and not dependent on batteries. The 2x CR123A cells operate the electro-mechanical release on the top plate of the camera (set into the film wind-on lever). Unless you are hand-holding the camera, which is perfectly possible with suitably fast films, then it is more convenient to screw a conventional cable release into the attachment on the lens, as you would with any large format lens. If you are considering buying a Fuji GX617, be sure to open the battery compartment and check carefully for signs of corrosion from leaking batteries. Many users forget that batteries are in the camera until it is too late, repairs will be impossible of expensive and it is best to remove the batteries completely if your camera will be mainly used mounted on a tripod. The Fuji GX617 is a big camera! Add a few rolls of film, a light meter, filters and a tripod and you will need to have a a comfortable backpack if you are hiking with the camera. It’s worth the effort, the 6x17cm frame is impressive and capable of huge enlargements. I did a series of talks at Focus on Imaging in 2010 (now ‘The Photography Show’) and Epson UK were printing my Fuji Velvia 50 images to 12×4′ during my talks. The detail in those prints was astonishing!